Antwaun Griffin is the International Trade Administration’s Deputy Assistant Secretary for U.S. Operations. Deputy Assistant Secretary for U.S. Operations delivers keynote at MMBA Power Luncheon. Last week, I, Mississippi Governor Phil Bryant and my esteemed colleague Joann J. Hill, Chief, Office of Business Development for the Department of Commerce’s Minority Business Development Agency, participated in the Mississippi Minority Business Alliance Power Luncheon in Jackson, Mississippi. 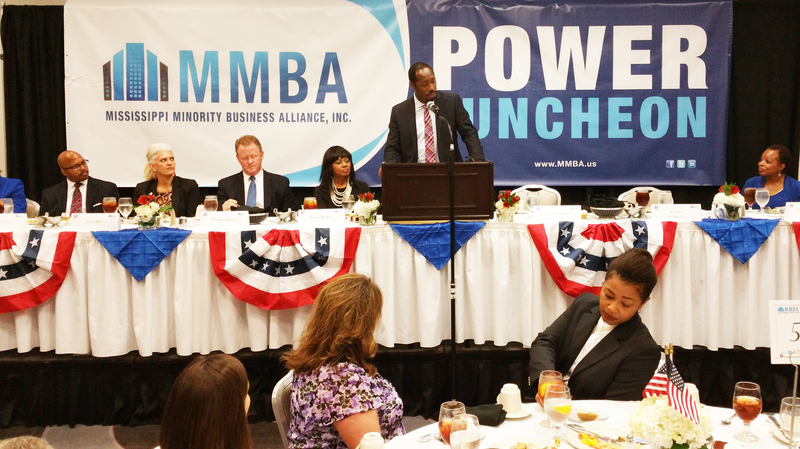 I was honored to deliver keynote remarks at the luncheon hosted by the Mississippi Minority Business Alliance, Inc. (MMBA) to promote international trade and economic development in Mississippi by providing information on business opportunities for individuals and businesses, including minority and women-owned companies, major corporations and institutions. In Washington, DC, relatively far from Jackson, I lead the International Trade Administration’s (ITA) U.S. Commercial Service domestic network of more than 100 U.S. Export Assistance Centers (USEACs). I frequently visit our offices and the organizations our USEACs partner with to help U.S. businesses begin exporting or export to more markets overseas. My part of the economic development pie is only exports; however, the Department of Commerce as a whole touches numerous aspects of economic development. Among many other resources — like the National Weather Service, which is always an interesting thing to point out — Department of Commerce bureaus offer trade counseling, technical programs, regional planning, and a variety of other resources that benefit U.S. businesses. Within Commerce, my peers like Joann Hill collaborate across the country with other federal, state, local and private organizations similar to MMBA. These are critical relationships because the more robust, collaborative, and widespread they are – as in Jackson – the more of a synergy they create. Across the country, organizations like MMBA that work to create or expand mutually beneficial relationships between women- and minority-owned businesses, suppliers and service organizations, are critical to minority businesses’ success. The reality is that minority businesses are more likely to export than other businesses. It is also true that we have seen a spike in minority women entrepreneurship. There are numerous reasons why minority businesses should export more. Minority-owned exporting firms are typically larger than their non-exporting minority-owned counterparts. In fact, average annual receipts for minority exporting firms were $7.4 million as compared to $141,776 for minority-owned non-exporting firms in the most recent data available. For all U.S. companies, the news on exporting is good. In July, the Department of Commerce highlighted data about the export totals achieved in U.S. metropolitan areas in 2014, which helped our country reach a national record of $2.34 trillion in exports for the year. In 2013, companies that exported to one market averaged just over $400,000 each in export sales, while companies that exported to 2-4 markets that year averaged more than triple that value. Presently, exports support an estimated 11.7 million U.S. jobs, up 1.6 million since 2009. On average, export-related jobs pay up to 18 percent more than non-export related positions. So, beyond the terrific group of small, medium, and large businesses; service providers; trade organizations; and fellow government organizations I spoke to last week, I will continue my trek around the country, touting the immense benefits of exporting. But I leave minority businesses with this one piece of advice: if you run a small shop, you know that keeping it going takes two things: time and money. If you are going to be serious about pursuing global markets, you have to invest the time and be prepared to invest capital as well. You can’t do this all alone, which is why we are here to help. Be sure to take advantage of the numerous resources available from the Department of Commerce, your state and local economic development organizations (including places like MMBA), and forge ahead with confidence! Note: Following the luncheon, DAS Griffin spoke with Mississippi Public Broadcasting. To listen to the interview, visit www.mpbonline.org.